During a short break at a live presentation in Wisconsin in 2004, Dr. Kiriac handed me a piece of paper with these three sentences above written in French and asked me to translate them to English in order to present the concept to our audience that night. At that time, I had only a general understanding of what he was explaining, but a few years later, after more talks with Dr. Kiriac, reflections and other research of my own, I have come to understand what he meant. Today I have a clearer “cause and effect” comprehension of this “grand complex” and I want to share it with you next. Let me start with an example that briefly describes the conventional medical view of cardiovascular disease. First, let us look at just two numbers. Heart failure – Also called cardiac failure, left-sided heart failure or right-sided heart failure. Heart failure is a condition in which the heart cannot pump enough blood throughout the body. Heart failure is not a heart attack and it does not mean that your heart has stopped or is about to stop working. It means that your heart is not able to pump blood the way it should. About 5 million people in the U.S. have been diagnosed with heart failure and millions more are undiagnosed. It contributes to at least 300,000 deaths each year. Heart attack – Also called myocardial infarction. A heart attack occurs when blood flow to a part of the heart is obstructed for a prolonged period of time, resulting in damage or death of that part of the heart muscle. Each year over a million people in the U.S. have a heart attack and about half of them die from it (500,000). Many people get permanent heart damage or die because they do not get help immediately. And in millions of more cases, drastic measures are taken to treat cardiovascular disease, such as coronary bypass surgery, placing mesh tubes (“stents”) inside the arteries to keep them open, or replacing the heart entirely. While it is incredible that modern medicine allows us to perform these operations, we tend to ignore the fact that in most cases, they leave the patient heavily medicated with severe side effects, paralyzed, weak and non-productive for the rest of their life. The current conventional medical model for atherosclerosis (arterial plaque) blames high cholesterol, or excess LDL (low density lipoprotein) caused by oxidation of LDL as a result of a diet rich in saturated fats. The focus of prevention in conventional medicine is to use drugs: drugs to reduce the LDL level in the blood, aspirin or Plavix to inhibit clotting and prevent heart attacks, and many more. The relationship to diet and exercise is usually secondary and only considered after the fact. High blood cholesterol is often accompanied by signs of chronic sugar elevation in the blood. This shows a disturbance in fat metabolism as well as the metabolism of carbohydrates and protein. Cholesterol is a major component of good circulation and good health. It is a fat-like substance required to provide lubrication in the lining of the arteries. In addition to the cholesterol we obtain from our food, the liver also manufactures cholesterol, which is used by the cells that make up the arterial lining. When arterial cells break down, they are excreted by the body and new cells grow to absorb the cholesterol in the blood. The concentration of cholesterol in the blood increases when the breakdown (death) of arterial cells exceeds the building up (birth) of new cells. Problems with cholesterol start with a diet rich in altered fats. When natural fats are overheated and cooked with starch as in fried potatoes, donuts, pie crust, pastries, potato chips, etc., they are altered and they become defective. Defective fats are brought to the liver, which, as you recall, manufactures cholesterol. However, when the liver manufactures cholesterol from defective fats, the cholesterol is also defective and breaks down quickly in the arteries. This leads to degenerative atherosclerosis (plaque), which is usually accompanied by elevated cholesterol in the blood. Natural fats do not lead to arterial disease. Many diets, such as that of some Eskimos, include large amounts of fat from seal and walrus, but the arteries remain normal and healthy. The arteries supply blood to the heart. When the blood has too much fat content it loses fluidity and the supply to the heart is reduced. This causes the heart to work harder and eventually become damaged. As the heart deteriorates, its muscles and valves lose strength and elasticity, and blood vessels harden. The walls of the heart dilate, its timing mechanism is disturbed and this magnificent organ fails. In the above dramatic look at heart disease, much of the reality is left out. The fact that the arteries, the blood, and the heart itself are made up of trillions of intelligent and self regulating cells is completely ignored. And what of the regulating and feed back metabolism of the heart: the pericardium, the vagus nerve, the thyroid and adrenal glands, the master pituitary and it overseer hypothalamus? They too are made up of trillions of cells. If you really want cardiovascular health, you should not only look at the conventional and/or the popular view, but also at the holistic and systemic view. We humans and animals are self-regulating organisms made up of trillions of cells that are each self-regulated. These cells make up organs that are somewhat self-regulating while all cells and organs are also subject to the regulating glands and overseeing organs: the thalamus and hypothalamus. Of course we cannot ignore the relationships between the heart and other organs, between all organs and the endocrine system, and between the endocrine system and hypothalamus. Yet all of these organs and systems are made of cells, hence the importance of cellular health and vitality. If we compare the heart to a motor, the adrenal gland pumps out adrenaline hormones as gasoline and the thyroid gland with its regulating hormones is like the carburetor. The pericardium and vagus nerve are the electrical pulse and spark that lead the heart to pump harder and pump more oxygen. When the thyroid, which controls the rate of the metabolism, is overactive, it causes the heart to beat more rapidly. When it is not active enough, the heart beats slowly and the person feels tired. The pituitary is the steering mechanism while the hypothalamus is the driver. The hypothalamus receives feedback from all the systems and monitors and regulates all metabolisms. 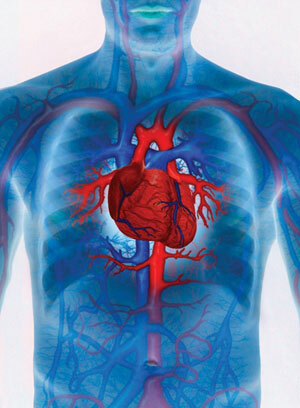 Acutely involved in cardiovascular health are the pancreas, the liver and the kidney. Chronic blood sugar elevation is a risk factor for coronary artery disease. Both the liver and the kidneys are involved in filtering the blood and when these organs are exhausted and cannot cope with the toxic load in the blood, it places a great strain on the heart. When the glomeruli (small filters) in the kidneys become clogged, the arterial blood pressure goes up. When the liver is congested, pressure builds up in the veins. The heart must work harder to push the blood through the kidney filters and the liver. So you see that in the conventional medical model, too much attention is placed on cholesterol or the heart itself while abnormal liver and kidney conditions are ignored. In order to have good cardiovascular health, one must take care of not only the heart and arteries, but also the liver, kidneys, endocrine system and hypothalamus. The shortest route to achieving overall cardiovascular heath is by prevention and repair through optimum cellular nutrition. The importance of avoiding fatty foods and junk foods, not overeating and introducing exercise into your daily life is critical. When the cells of the body receive the nutrients and the resulting energy that they need, they, like a good virtuoso will perform their multitude of cellular metabolic activities: growth, repair, cleansing, regeneration, protection and much more. If each cell of the organ performs its job well, then the organ will have a fighting chance to perform its metabolic activities. But let us not forget that cellular and organ health functions are governed by the glandular level, which itself is overseen by the “master gland” – the hypothalamus. There is no doubt that BAC’s nutrients efficiently nourish all the cells of the body including the cells of the hypothalamic region. In the words of Dr. Michael Kiriac, it is in that sense, that BAC awakens the “genius” within. Several phytonutrients and pigments found in BAC such as beta carotene, alpha carotene and astaxanthin have been proven in human clinical trials to penetrate the blood brain barrier and furthermore penetrate the blood iris barrier. In several studies done on spirulina, it was concluded that spirulina lowers serum cholesterol and is likely to have a favorable effect in alleviating heart disease. Benefits may be a result of its effect on the metabolism of lipoproteins. There are a few specific nutrients present in BAC that are effective at improving elasticity of heart tissues, increasing protection of the vascular system, preventing and reducing “bad” cholesterol and preventing atherosclerosis.